In the prior year Google Author ranking concept has been regularly progress. In this article we provide discuss about Author Rich snippets, Google Authorship, featuring a person photo, byline and also Google Plus (G+) profile all has been a game changer for CTR (click through rate) of organic result of searching. Google Authorship: It allows users to declare your content & make it feel more special. By adding author detail to search engine results, behind of the content peoples/folks can directly see face & name of the author through the Google authorship. Google authorship snippets incorporated in searching results, it’s creates a powerful impression. It set-off with two ways one is create feeling of trust and credibility, or it could seem shady, sketchy and untrustworthy. There is not a negative impact consequently to Google and it’s not a stretch to bet that your CTR will be boost noticeably if you add authorship of Google on your site/website. In the segment we talk about the process in details how user can add Authorship of Google on your website. Step 1) Make a Google + account & confirm your email address. 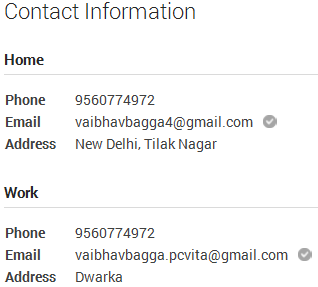 Once you generate Gmail address then you can create G+ account side by side. After creating confirm you email through the contact information. how you can check go to G+ profile “about” you will see check-mark on their email address that proof you verify the your email. 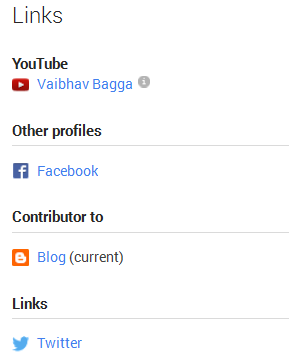 Go to G+ about page you see link section; add your content in the “Contributor” area. This might be blogs, personal websites and social website page like Facebook page, Twitter page etc. Using the rel=”author” tag link to your G+ profile either from author box at the bottom of your site. You can also apply same thing with word press page, blogs, article etc.